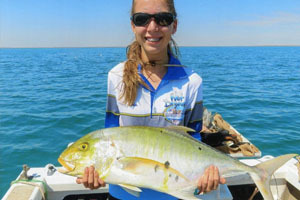 Aussie angler Chloe Horndhart – age 12 – potentially set the new women’s 6 kg (12 lb) line class world record for golden trevally (Gnathanodon speciosos) with this 7.29-kilogram (16-pound) fish that she caught on April 24, 2108 while fishing off Karratha, Australia with her father Jason Hornhardt. The fish ate a live mullet and Chloe needed only 10 minutes to land it. The current world record is 7.16-kilograms (15-pounds 12-ounces). 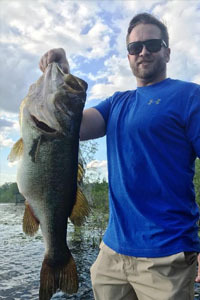 Angler Lance Jones potentially tied the All-Tackle Length world record for largemouth bass (Micropterus salmoides) with this lunker that measured out to 65 centimeters (28 inches) in length. Jones caught the on April 24, 2018 while fishing a live shiner on an unnamed lake in Central Florida. The current All-Tackle Length world record is 65 cm. 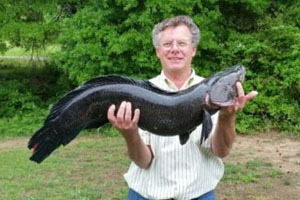 Angler Emanuel Tankersley caught this 8.76-kilogram (19-pound 5-ounce) northern snakehead (Channa argus) on May 15, 2108 while fishing Potomac Creek in northern Virginia. Tankersley needed only four minutes to subdue the massive snakehead after it crushed the frog-patterned lure he was casting. If approved, the catch will become the new All-Tackle world record which currently stands at 8.05-kilograms (17-pounds 12-ounces). 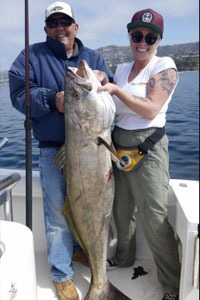 Angler Taylor Kingsmill caught this 30.52-kilogram (67-pound 4-ounce) white seabass (Atractoscion nobilis) on April 25, 2018 while fishing off Dana Point, California with her grandfather Jim Kingsmill. The potential record seabass ate a live mackerel that Kingsmill was fishing on a jig and put up a tough 20 minute fight. If approved, the catch will earn Kingsmill the women’s 24 kg (50 lb) line class world record, which currently stands at 29.03-kilograms (64-pounds).